Tyger at Point Sublime on the North Rim of Grand Canyon. Photo by Shannon Henry. I grew up in the mountains in Estes Park, Colorado, but moved to Phoenix, Arizona, right after dirt was invented in the Sonoran desert. I was educated in graphic arts and owned an advertising agency for more than 20 years. More than a decade before the end of the last century, I started writing software and have authored several commercial programs, including an addictive, strategic computer game of chance I named FIVE PLAY Casino™. I then designed and programmed websites for clients, creating more than 150 sites as part of my USA Web Directories network for local business advertising. For three years, I worked as a front-end web programmer for Kim Komando. I currently am a professional travel and nature photographer and photo retoucher. I have a black tuxedo cat named Black Jack, and I enjoy outdoor sports such as fishing, hiking, boating and camping as well as traveling all over Arizona and other western states. I am a member of American Mensa, and served twice on its national board of directors. I'm into playing games like chess, Boggle, Stratego, and MasterMind, and often engage in lively discussions of politics and philosophy. I believe my artistic talents and my love for animals and Nature have inspired a true passion for photography in me. Photography is a good medium of expression for me because I approach it with an artist's eye. I specialize in natural abstract art, scenics, and nature and wildlife photography for travel and tourism, and for use on the new aluminum prints for home and office wall artworks. I have shot more than 300,000 photos in the last 20 years and have finished up about 1% of them to be displayed on my gallery and sold as prints here. My objectives are to take great photos of the fascinating plants and animals and many beautiful places that still exist in Arizona and show these pictures to as many people as I can. I want to help everyone appreciate and respect Nature so they will take better care of the environment, and show them where to go to experience it all for themselves. In the process, I hope to motivate folks to get outdoors more and go hiking and camping to be healthier, happier and enjoy life more. 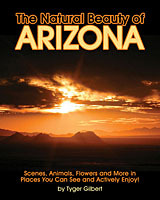 My book, "The Natural Beauty of Arizona," contains more than 500 of my best pictures, makes a great gift, and is available on Amazon.